Stay tuned and DISCOVER something new each time you join us. Sign up to the ENEWSLETTER FOR THE LATEST NEWS. On Saturday the 6th of April, we are delighted to host a life music event with Amy! B’acino will be celebrating all things Irish on the 16th November from 8pm onwards. On the night you will experience traditional Irish fare along with some traditional drinks like Irish coffee, Guinness, Hot Toddy’s and many more.. Come and join us! 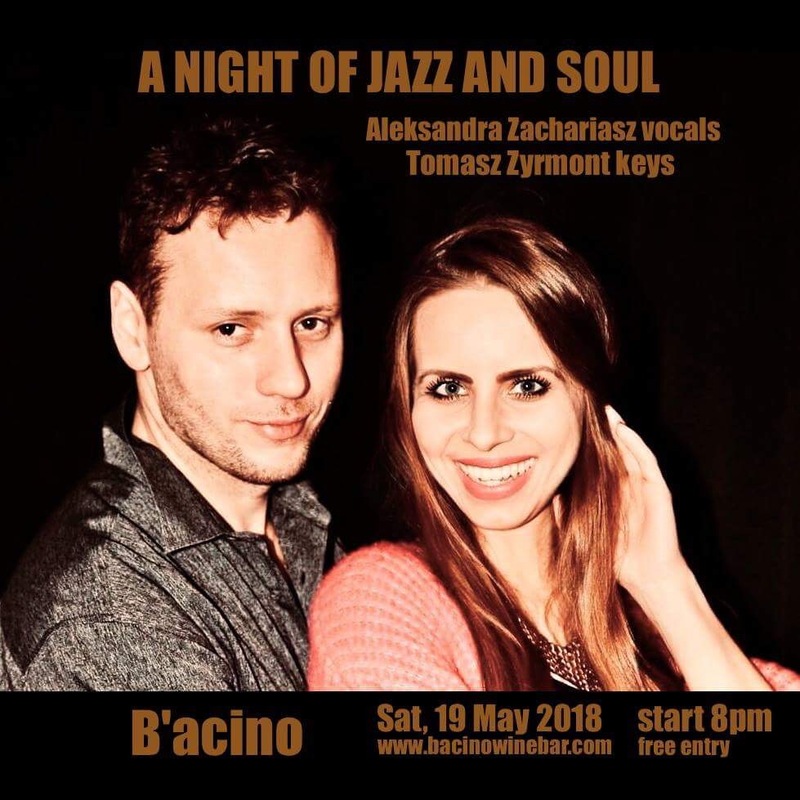 Founded in London, the brilliant duet formed by our resident pianist Tomasz Zyrmont and singer Aleksandra Zachariasz will be playing B’acino’s next music event “A Night of Jazz and Soul”. in association with Deluxe Entertainment Services Group. Aleksandra Zachariasz regularly performed on the Polish national TV in talent shows, such as The Voice of Poland or Must Be the Music. She is also an award winner of numerous music festivals, such as The Radio Yard’s Super Microphone. Powerful songs, inspirational solos and fantastic atmosphere guaranteed. Fantastic London-based duet Tomasz Zyrmont (pianist) and Lorenzo Bassignani (bassist) will be playing B’acino’s “Evening of Jazz and Grooves” on Saturday 21st April. The musicians started their cooperation in 2009 when Tomasz invited Lorenzo to join his band and to record the Groove Razors album. Since then, the musicians have performed together at a wide variety of venues and festivals, including concerts for Jazz FM radio and performances at the World Travel Market, Yamaha Music Live and East European Jazz Festival. They have individually played and toured in USA, Germany, Poland, Italy, France, Belgium and Japan. Entry is free, but booking a table is recommended. Ardent independent music fans might know Johannes Refsdal better under his alias Joey Haynes, previously one third of folk rock outfit Bear’s Den, with whom he parted ways in 2016 to focus on other musical endeavours. He writes songs about love and alcohol, and draws inspiration from the likes of Leonard Cohen, John Martyn, Warren Zevon and Paul Simon. Join us this Saturday as James Hoyle gives us a glimpse into his forthcoming debut album. Influenced by a life lead on the road, the Australian singer-songwriter's music takes its cues from the blues, folk and rock. Expect original songs along with some of your favourite classics! Entry is free, but you are advised to book a table. We'll be having a lot of music for your Saturday nights! On 3rd March it's antifolk duo Erin K & Tash, who have headlined many of London's must-do venues and been featured by The Guardian and BBC 1 radio. They will perform their heartfelt and quirky style of folk, with appearances from special guests. This Thursday evening, our good friends Kelly Halloran and Gerry Farrow will be playing in B'acino. Kelly will start with a solo of jazzy classics and Gerry will join in with everything from Amy Winehouse and Coldplay to some originals! Come and enjoy a glass of wine and some amazing dishes from the new menu. Following our sell-out November wine with dinner evening, we are pleased to host wines from the family-owned estate in Tuscany, Castello Banfi. The wines of Banfi are born of a passion and love for unique terroirs, which is why we adore them! This 6-course tasting menu with wine pairing for £39 is only available for 15 lucky people. Join us on Thursday 9 November at 7pm to discover the wonderful undiscovered wines from Tuscany. Daniele Girolami, the export manager of Poggio le Volpi, will be unveiling, for the very first time in the UK, the winery’s new Roma DOC at B’acino on Thursday 12th October at 7pm. This is your chance to discover this outstanding wine from the Lazio region along 3 other delectable wines from the same estate before anyone else does. As always, our brilliant chef Mirko will pair each wine with culinary specialties from the same region. For the occasion we decided to create a special event to showcase Kaki's beautiful canvas. Starting from Thursday 3rd August, join us every Thursday and sip one some fine wines while Romain - Kaki's cousin - explains the story behind her meaningful and full of hope canvas. Wine Flight: Identify how climate affects the taste of Pinot Noir! Tackle the fascinating world of Pinot Noir, shake your senses and strengthen your wine knowledge with an intriguing Wine Flight – our very first! This month your little grape kiss - B'acino - is proud to introduce you to the UK sommelier of one of the most legendary French wine estates: Paul Jaboulet Aîné! For this one of a kind wine tasting, Charlotte - Paul Jaboulet Aîné's UK Sommelier - is coming from France especially for you to try 6 of her delectable wines while telling you more about the expression of Rhône's world-famous terroir. In addition and like in all our wine tastings, Chef Mirko will be pairing each wine, with some exquisite dishes. This time, he will get your taste buds racing with his take on some classic French specialties! Live Music at B'acino: Introducing the talented violinist Kelly Halloran! Yes! You heard this right. B'acino is utterly delighted to announce that on Thursday 7th September, from 7pm until 10pm, the incredibly talented Kelly Halloran will be playing your favourite songs live at B'acino! This is your one chance to listen to Kelly's enchanting voice and outstanding violin skills before she goes back to the US. So, DON'T MISS OUT B'ACINO FIRST EVER LIVE MUSIC EVENT, save the date and come to B'acino after work! Because we are a little grape kiss that travelled the world to bring you a fusion of the most delicious wine & food pairing, we are organising monthly event for you to discover our inspirations. For our first wine & food pairing dinner, we decided to honour our Italian roots by allowing you to discover Mirko's natal Island - Sardegna - around a set menu you won't forget! B'acino is utterly delighted to introduce you to Puglia's finest wine maker, Tormaresca, during our first ever wine tasting event! For the occasion, we invited Tormaresca's brand ambassador for the UK to present you to 6 of the Italian domain's finest wines and, to complete your experience, Chef Mirko will be pairing each one of them with some of Puglia's most exquisite specialties.